INDUSTRY.co.id - Bekasi - Darul Rizki Pratama Foundation (DRP) conducts social activities in the form of donations to Orphans and Dhuafa and Religious Lectures by several speakers. The event took place on Jl. Cut Mutia Margahayu, Bekasi was held on Thursday (20/9) after carrying out the Ifthor Jamai (iftar) joint event and continued the evening prayer at the event location. No less than 500 more invitations came and attended the event. "We from DRP can only advise all children here to keep their worship spirit. 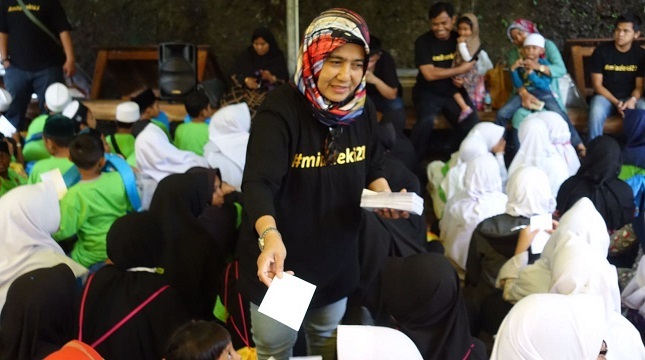 Keep on praying diligently, diligently reading the Quran and also study diligently and multiply prayers to be granted all the wishes of the orphans," said Mrs. Ermi in her speech. Besides giving donations to orphans the DRP Foundation activities this time were also filled with religious lectures delivered by KH. Shoi Lubis and Ustd Fadlan Garamatan (Ustadz Sabun from Papua). And there were also remarks from the bekasi figure who had nominated as the Candidate for Bekasi Mayor, Nur Suprianto who was also a member of the West Java Provincial DPRD.